Available as a standalone antispyware program for Windows XP, Windows Defender shipped with Visa and Windows 7, then it replaced Microsoft Security Essentials as a full antivirus solution since Windows 8. Now, the time has come for it to protect those using the popular Chrome browser, as an extension. Although Windows Defender is now a full antivirus solution that Microsoft has been calling Windows Defender Antivirus since the release of Windows 10 Creators Update, this piece of code has just been made available as a browser extension for Chrome as well. According to data from NSS Labs, Microsoft Edge provides a level of protection against phishing attacks that reaches 99 percent. On the other hand, Google Chrome only deflected 87 percent of the threats, and Mozilla Firefox only managed to protect its users from 70 percent of the incoming phishing threats. 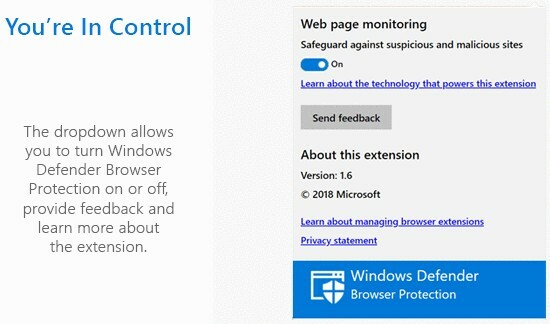 The Windows Defender Browser Protection extension for Google Chrome does not come with any fancy features, being a very easy to use solution that offers an additional layer of protection similar to the protection provided by Microsoft Edge. According to Microsoft, "The extension alerts you about known malicious links, and gives you a clear path back to safety." Windows Defender for Chrome uses a continuously updated list of harmful sites and features a real-time indicator of such sites, as well as the status of the currently loaded website. This Chrome extension has been rated by 68 users so far, after more than 20,000 people downloaded it. Its average rating stands at an impressive 4.82/5 stars in the Chrome Web Store. It only has 295 KB in size and the latest version, dated April 11, is labeled 1.62. Back in early 2005, Microsoft AntiSpyware was released as a beta software, but later that year it became Windows Defender. First available as a downloadable application to all validly licensed Windows 2000, Windows XP, and Windows Server 2003 users, it became a part of the Windows operating system with the release of Windows Vista. However, it was only an antispyware component that Microsoft Security Essentials would disable and remove upon installation. In Windows 8, Microsoft finally made Windows Defender the built-in antiviral solution that would replace Microsoft Security Essentials.